How Do You Answer Three Questions Successful Entrepreneurial Company Managers Must Always Answer: What Business Are You Really In, Who is Your Competition, What is Your Growth Strategy? Looks like three simple questions. But most entrepreneurial emerging firms struggle to answer these and fail. Not convinced? Just look at the numbers- about 50 % of all start-ups fail within the first year and 60 % fail or show no growth in 5 years. Very sobering statistics and and often the result of companies not answering these three questions. So how do you answer these questions? Easier for large established companies who have more resources to attract and hire experienced management staff. Much tougher for managers of early stage companies focusing on today’s business, using cash to meet current bills, paying minimal attention to longer term strategic issues, often not really knowing how to answer the three questions. These questions are deceptive and really tough to answer for most early stage companies. Why? 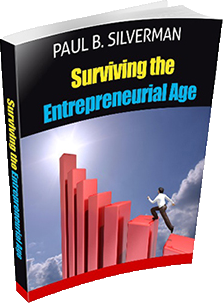 Well, today’s explosive entrepreneurial age is changing the business landscape: creating new markets (mobile apps, online video, ebooks); destroying traditional business (bookstores, record stores, newspapers); changing how we develop, manage and grow companies. Disruptive technology innovation is driving new directions, new challenges, new rules in all market sectors. And like an unexpected critter on a chopstick, today’s tsunami-like market and technology changes often occur when you are least prepared. So to avoid being a failure statistic, entrepreneurial company managers must adapt, develop new perspectives, learn new management techniques, really think and act like management of larger corporations. Saying this another way, management skills needed to start a new venture are dramatically different from the skills needed to manage and grow a successful business. Sounds simple, but that means managers must change- moving from start-up to high growth management mode means developing new perspectives, addressing new issues, using new management tools, asking new questions, solving new problems. Tough for many entrepreneurs to accept but that is a fact. Helping entrepreneurial company managers succeed is the mission of a new highly praised book, Worm on a Chopstick: Understanding Today’s Entrepreneurial Age: Directions, Strategies, Management Perspectives. Driven by real world experiences, “Chopstick” provides perspectives, strategies and tools helping today’s entrepreneurial firm managers succeed. -Liz Sara, Managing Director, Best Marketing LLC. 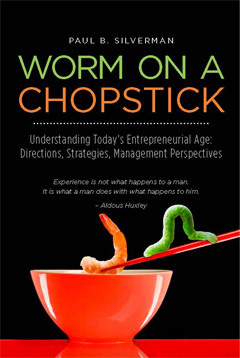 In 2011, The 35th Anniversary Edition of Directors & Boards magazine featured Worm On A Chopstick: Understanding Today’s Entrepreneurial Age: Directions, Strategies, Management Perspectives in its recommended reading section “Book it: Best bets for board reading”, selecting the book as one of 8 books recommended. Directors & Boards magazine targets officers and directors of public companies. For additional information refer to Worm On A Chopstick Featured in Directors & Boards 35th Anniversary Issue. -Liz Sara, High tech marketing consultant, entrepreneur, angel investor. -Ernest M. Stern, Shareholder in the corporate and securities practice group at Akerman Senterfitt LLP, a full service law firm with offices throughout the United States and the largest law firm in the State of Florida. 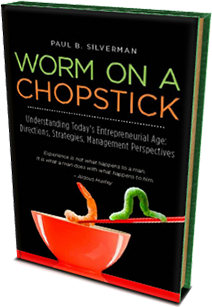 The second book in the Worm on a Chopstick series, provides the foundation for Entrepreneurial Management 2.0, helping entrepreneurs improve management skills, attract funding, grow their business, and be a “Survivor” entrepreneur. The first book in the Worm on a Chopstick series addressed global entrepreneurial management issues, where we are heading, and provided recommendations and strategies to address today’s challenges and opportunities impacting emerging and traditional companies in all market sectors. The Worm On A Chopstick series is written in an entertaining, anecdotal, highly readable and non-technical style. Provides entrepreneurs with an overview of new equity crowdfunding regulatory developments, new state crowdfunding regulations and outlook, and implications and opportunities for entrepreneurs. 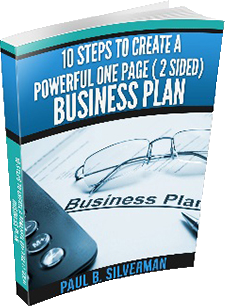 Provides entrepreneurs with a winning formula developed and used by the author to create POWERFUL One Page Business Plans. 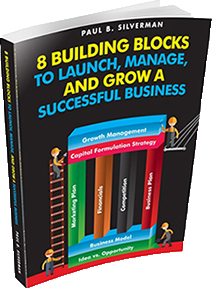 The book is another contribution by the author to help entrepreneurs improve management skills, attract funding, and grow their business. The third book in the Worm On A Chopstick series, will review 10 disruptive technology trends, enhance the Entrepreneurial Management 2.0 skills portfolio, and include interviews with selected leading entrepreneurs. A portion of the proceeds from all book sales is being donated to the American Cancer Society.